It was 2009, Obama had just been inaugurated and the great recession was picking up steam. At the time, I was guiding the real estate industry through the transition from hard sell tactics to social marketing. 2009 wasn’t a good time to be a Realtor (yes, Realtor is supposed to be capitalized), and the last gasps of “it’s still a great time to buy” were being broadcast all over Facebook as housing prices plummeted. Consumers hated it, and often railed against it because the real estate industry was being perceived as the root cause of the financial crisis. Real estate marketing is unique because contracting the services of a Realtor to buy or sell a home happens very infrequently. The industry had the reputation for shotgun brand marketing — direct mail, shopping cart billboards, incessant handing out of business cards that asked for referrals to friends and family on the backside — that stressed the importance of being “top of mind” when that transactional decision takes place. I had been making the case that it was far more effective for Realtors to use blogs and social media tools like Facebook and Twitter as communication channels to engage their communities. I was part of a close knit group of early real estate bloggers we called the RE.net, and by 2009, already had a few years under my belt advising the industry. I knew hyperlocal engagement worked because we were early developers of real estate blogging systems, and advised Realtors to focus at least 50% of their writing on chronicling their communities. In essence, this makes Realtors more approachable, and thus top of mind. So my advice to Realtors in early 2009 was to hunker down and wait out the storm. Don’t sell a bad product because as part of the community you need to face them the next day. Good Realtors have always positioned themselves as hubs of their communities by serving in chambers and foundations, and spearheading fundraising for good local causes. The concept I proposed was simply to extend their community leadership role into becoming the local media hub. In 2009, local newspapers were disappearing. “Be the media” became a war cry for citizen journalism. If Realtors could “be the media” in their town or neighborhood, they not only could contribute their voice, they could also bring in and support the voices of other players and newsmakers in their community. Being generous with local media support was paying it forward. It made it easier for a Realtor to walk into a restaurant and tell the owner how much they loved the food and can support their business using media. First impressions matter, and that was a better introduction than palming a business card that makes its way into the trash. 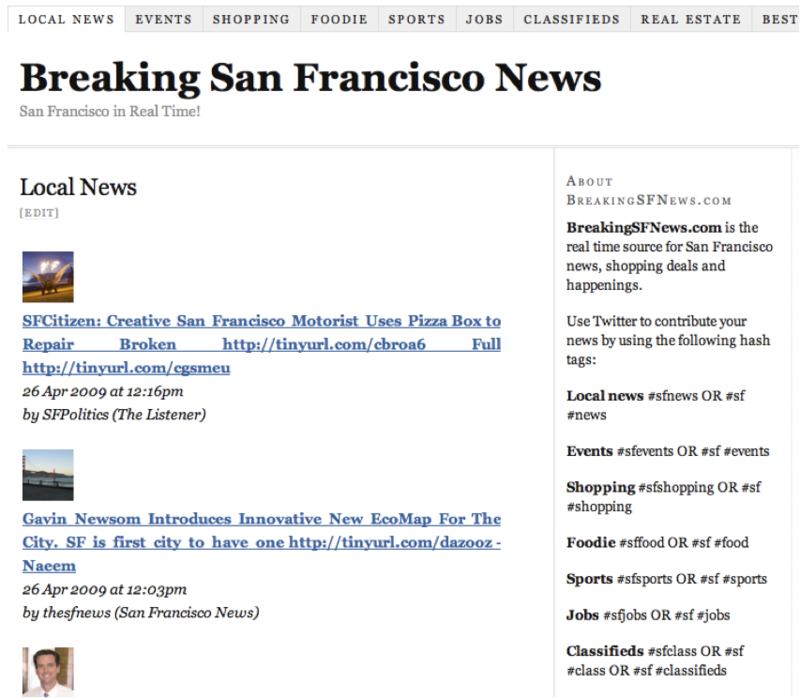 How did we build hyperlocal media in 2009? We needed to build a hyperlocal news system that fulfilled two requirements. Realtors weren’t journalists and didn’t want to be journalists, so local news delivery had to be automated. In 2009, no local news service had curated the best media and blog feeds in a city or neighborhood (and no local news service seems to have done so since on a network level), so we simply identified really interesting content feeds and tried to avoid those with a lot of car crashes and crime, like online TV station news. Second, Realtors needed backend access so we opted to build the website on Wordpress, a blogging platform that we already used with our real estate client base, and also built parallel news systems on Twitter and Facebook. I was an early Twitter adopter, and instantly realized its local broadcasting capabilities could be communication channels for Realtors. I also unfortunately advised them to join Twitter and follow as many locals as possible. If you were on Twitter in 2007, you may have noticed that sometimes 1/3 of the active Twitter feeds in a town were Realtors. To automate the news system, we used Twitter as the 24-by-7 delivery mechanism. First, we curated our Twitter accounts (see @BreakingSFNews as an example) by categorizing the Twitter feeds in the city into 20 lists (the maximum number Twitter allowed until recently) including Local News, Foodie, Sports, Arts & Culture, Things to Do, etc. Then we cobbled together a Twitter widget (before Twitter did) that would display our curated Twitter feeds in real time across the topics. This April 2009 Slideshare presentation that introduces the Breaking News Network illustrates what we did. From inception, we steered away from traditional news reporting due to costs, and wanted to get the community at large to contribute to the news stream. We set up a hashtag system that would pull in other Twitter commentary if they used specific hashtags like #sfsports or #sfevents. A more sophisticated version of this facility continues today on the Network as our Media Amplification Program, where we retweet the tweets of authorized local newsmakers — city politicians, civic groups, performing arts organizations, nonprofits and investigative news services — when they use a specific city hashtag like #SF for San Francisco. It has worked well for over 3,000 (7/24/14 update now 7,000) authorized contributors, and we don’t ever have spamming problems. The facility makes our Twitter feeds communal, and can set the stage for the development of national advocate networks when used by groups or organizations. Everybody’s first question. There is none for the Network. The Breaking News Network has always been committed to community service and the social good. We’ve strived to position the Network as a kind of PBS of social media sourced news, and are planning to make the network a B certified property that will always remain pristinely non-commercial. We are building business models that support the public good. Our first is BNN Funding, a crowdfunding services company that leverages the BNN in supporting nonprofit and for-profit campaigns for social impact, community service and the arts. All media business models, most of it based on advertising, require traffic. Since The Breaking News Network is noncommercial, we didn’t need to devote resources to push traffic to the websites. Moreover, each city has its own original domain name so we don’t follow the classic domain/subdomain structure that media companies use to aggregate traffic to the principal domain. Frankly, as Patch has demonstrated, local ad models have proven impossible to build at the network level. Without the pressure to badger the community for funding or ad sales, we’ve generated considerable community good will that hopefully translates into receptivity for our messaging to support the local good in each of our cities. Building a strong social media profile in each of our 400 cities is key to sustaining our mission to do good. It takes a long time, 5 1/2 years in our case, for our 400+ feeds to become local news institutions on Twitter, Facebook, and Google+, now in aggregate numbering 700,000 followers. It’s an asset that no other hyperlocal media can develop quickly simply because building local presence doesn’t scale. The corollary to #1: we don’t care about traffic so we direct it out to every organization covering local media who does need the traffic to fulfill their business models. First and foremost, we respect journalism. We love curating good local journalism, and our websites and social media all point back to the original content. Since the Network’s mission is community service, we want local media, from indies to alt weeklies to Patch, to thrive, and we’ve developed good relationships based on the promise that we have their backs and won’t compete with them for ad dollars. We’ll always go out of our way to support new journalism models. Nonprofit news networks like the Investigative News Network and The Media Consortium have member bases that are national in scope but often report on local issues. We created partnerships with these networks to make sure their local articles get distributed to our localized reader base where it has immediate impact. An article about Detroit simply needs to be read by Detroit locals. Coding can be costly and always needs updating; it’s far more efficient to partner with third party applications to augment functionality and design. We chose Wordpress because of its extensibility and easy accessibility for our community of users. Dlvr.it drives our social media feed delivery, Rebelmouse renders our social media feeds into an elegant tile format display,Grouptweet powers our Media Amplification Program, and Spingo shows our readers local events in a visually friendly timeline. Even for our new project BNN Funding, we’ve adopted the white label Crowdtilt Open platform to support our crowdfunding campaigns. We proved that we can build a hyperlocal media network that serves the community good, and outlasted AOL’s Patch, even after they invested several hundred millions, in the process. The Breaking News Network is now the most comprehensive hyperlocal media network in the world today, covering every major city in the US and Canada, as well as Australia/NZ, the UK and India. We’ll leverage the BNN to tackle another industry that needs improvement. The current crowdfunding model is inadequate, entrepreneurs upload their projects onto Kickstarter or Indiegogo and hope and pray their campaign will tilt without additional marketing support beyond their own email lists. With BNN Funding, we’ll disrupt the crowdfunding industry by introducing the next phase of collaborative crowdfunding, where project creators receive massive syndicated support for their campaigns by leveraging the BNN.